with Julija Melnik (LT) and Aigars Stirna (LV)! It is a great opportunity to meet and try contact improvisation and Argentinean tango together! We will enjoy freedom of movement and dance, look for synergies between contact improvisation and Argentinian tango, investigate ways to embrace and contact, play with gravity and balance, apply body and mind preperation techniques. Contact-improvisation is listening and absence of roles, spontaneous and free movement, following the unknown, exploration-game. Mostly it’s a trio between two dancers and the floor. Argentinean tango – clear roles of leader and follower, giving up to the guidance of the partner or the emotional and expressive music, specific steps and figures which belongs to this dance form. Usually it’s a trio between two dancers and the music. If you are familiar with contact improvisation (CI), then it is a chance to “frame” your experience in the dance of emotions and polarities, develop your will while studying structure, take responsibility of leading or completely give up and follow. Tango dancers for sure will find something new and unusual! At least – the embrace will become more enjoyable, the sensitivity and feeling of the partner will increase, the doors to improvisation will open more widely. If you have no experience – you will enjoy the discoveries! 90 eur* for seminar (includes 5 workshops (13 h), 2 bodyworks (3 h), 2 meditations (2 h). 100 eur** for the whole weekend (seminar + 3 milongas). * If applying and paying the registration fee*** untill 14th of October, later – 100 eur. ** If applying and paying the registration fee*** untill 14th of October, later – 110 eur. 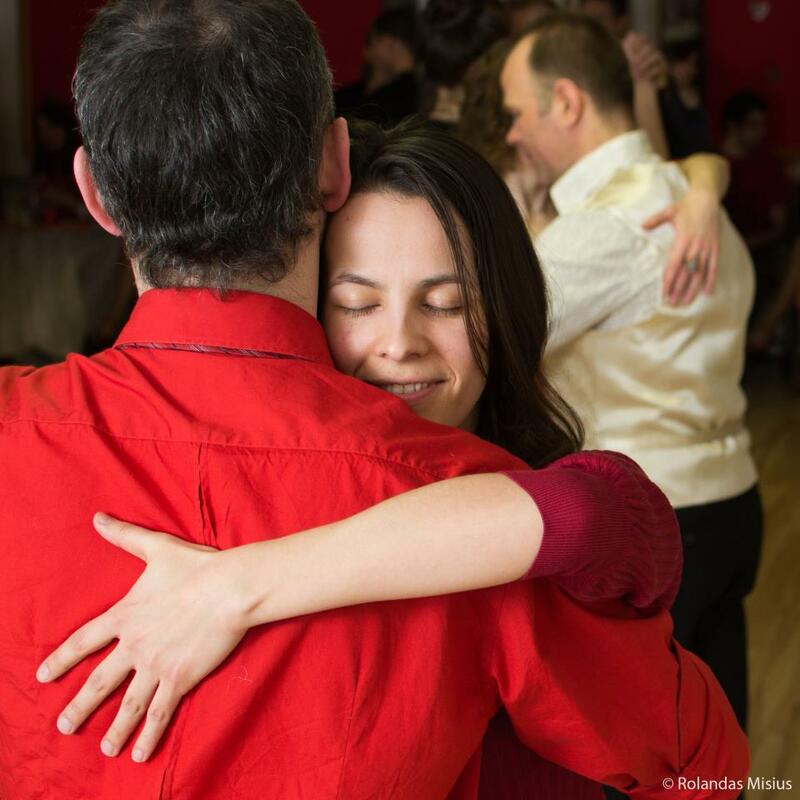 Sun milonga-JAM – donations 3-5 eur. All 3 milongas-JAMs – 15 eur. In cash to Aigars or Julija or via bank transfer to SIA Tangostudio, Reg.Nr.50103169211, Swedbank, SWIFT HABALV22, IBAN account Nr: LV41HABA0551020839535, Contact-tango seminar. comfortable and enough clothes for active movement. Tango shoes are not necessary. Warm sweater and woolen socks for a slow motion movement or resting moments in the studio. Something to write on/with. Snacks, something to eat for lunch. Julija Melnik, BA, MA – Tutor in Dance – is leading regular contact improvisation classes, jams and workshops in Lithuania. She has also taught outside of Lithuania (Ukraine, Latvia, Russia, France, Germany and USA). Julija is actively participating in International CI festivals, teachers’ conferences and is also organizing CI events in Lithuania: annual CI and Performance Mini-festival since 2007, regional CI teachers’ conference in March ‘08, Vilnius CI and Performance Festival ‘09. Julija has studied contact improvisation with CI pioneers – Steve Paxton and Nancy Stark Smith, and also with Nina Martin, Andrew Harwood, Angela Donii, Joerg Hassman, Charlie Morrissey, Adrian Russi and many others. She is also exploring other improvisational forms and performance, and has studied with Julyen Hamilton, Daniel Lepkoff, Nita Little, Alexander Girshon, Keith Hennessy, David Zombrano and others. Julija is also practicing Argentinean tango, Gurdjieff movements, house dance, salsa, contemporary dance. Her movement research is informed as well by practices of meditation, bodywork, dance therapy and other movement techniques such as Feldenkrais, Lou Yong. Julija is a student at Free University of Samadeva (France) and her studies include Family Constellations and Systemic Representations, Dervish Yoga (Samadeva Gestural Euphony), Hakim Massage and Training as an Euphonist Energetic Practitioner (Well-being coach). Aigars Stirna, Bachelor of Music and certified social pedagogue, is dancing Argentinian tango since 1999 and leading regular classes, milongas and workshops in Latvia since 2003. He has also taught in Lithuania, Estonia and Germany. Aigars is founder and director of TangoStudio (together with Ginta Opmane) – first in Latvia tango school (since 2005). Aigars is organizer of first in Latvia international tango events – first summer school (Salacgrīva 2007) and first Tango Sun Festivals (in Riga&Jurmala, 2008&2009). He is participating as dancer and teacher in tango festivals, fashion, music and dance shows and concerts in Latvia and abroad, as well as dancer and actor is taking part in different movies. He was tango choreographer for Latvian National Theatre in 2009 for play “Uz neatgriešanos”. Aigars has studied tango with many great masters, including Gustavo Naveira & Giselle Anne, Mariano Chicho Frúmboli & Juana Sepúlveda, Adrian Veredice & Alejandra Hobert, Julio Balmaceda & Corina de la Rosa, Ezequiel Farfaro & Eugenia Parilla, Juan Camerlingo & Diana del Valle, Ricardo Barrios & Laura Melo, Hugo Mastrolorenzo and others from Argentina, as well as with Anja Tress & Carsten Vaniorek, Laura Priori & Andreas von Maxen, Ilona & Salvador Rios, Gaia Pisauro & Leandro Furlan and others from Germany. He was student of tango teacher school „Estudio Südamerica” of Juan Dietrich Lange in Berlin (2005-2007). He is also exploring other improvisational forms. He has studied contact-improvisation with Inese Upe, Julija Melnik and Ady Elzam, performance with Paolo Cingolani, as well as contemporary dance and african dance.